They have proven their worth in detecting landmines but Africa’s giant pouched rats have a lesser-known but equally critical vocation – saving lives by speeding up tuberculosis detection. It’s all in the nose, says the Belgian non-governmental organisation APOPO. Its founders, in 1997, saw potential for these abundant rodents with a sense of smell as keen as a dog’s but dismissed as pesty vermin — or a potential meal. “The biggest obstacle has been the negative perception that people have of the rat,” said APOPO director Christophe Cox, whose NGO has been based in Morogoro in Tanzania’s eastern highlands since 2000. Yet 83,000 landmines have been neutralised in Africa and Asia thanks to the rodents, APOPO says, saving countless lives where explosives still maim and kill up to 20,000 people — many of them children — each year. “When I first heard about this technique I was a bit shocked, but it proved to be quite efficient, in fact more efficient than the microscopy we use,” said Daniel Magesa, a doctor at Pasada Upendano Clinic in the capital Dar es Salaam which now sends APOPO’s Morogoro base some 200 human sputum samples every month. Africa accounts for most of the million-plus people who die of TB each year and untreated carriers can infect dozens of others, making speedy detection essential. “The problem is the concentration of the TB in the samples we have. It is sometimes not concentrated enough for us to see it through the type of microscopy we use, even though it is very modern,” Dr. Magesa said. Today, more than 29 hospitals in Dar es Salaam and Morogoro send the Morogoro lab sputum samples. Another dozen clinics in the Mozambique capital Maputo send samples to an APOPO center opened in that country in 2013. The NGO says it has detected 10,000 missed TB cases, identified by workers like Oprah and Violet, whiskers bristling as they move along a row of test tubes. “The big advantage is how quick the rats are. They can go through 100 samples in about 20 minutes, and this is what a lab technician will take four days to do,” said Cox. During TB detection, rats are presented with a mix of negative and positive samples, the latter decontaminated for safety “but the smell remains”, said training director Haruni Ramadhan. When a rat identifies a “true” positive, it is rewarded with a banana-peanut butter mixture. “We can only reward the rat if we are certain it is right,” Ramadhan said. The negatives are not necessarily suspicious but become “suspect”, and subjected to further testing, if the rat reacts. “Thanks to the rats, we have increased (TB case) detection rates by 40 percent” in the participating clinics, said Cox — citing the same figure given by Dr. Magesa. 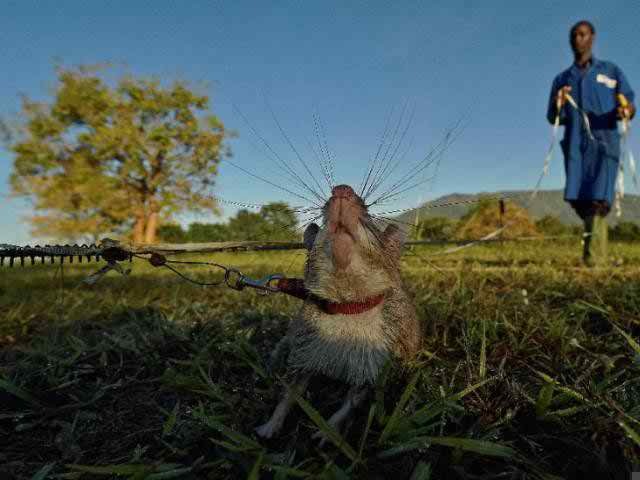 APOPO now employs 222 rats — 108 for demining and 42 TB detectors. 0 Response to "Tanzanian rats with nose for trouble train to save lives"